My father would grow all these vegetables himself and my mother would prepare them for table – it’s a dish that’s still popular with a lot of French families for Sunday lunch. For the dressing, whisk the Dijon mustard with some seasoning, the white wine vinegar and 5 tbsp cold water. Whisk the oil in slowly until emulsified. Set aside. Put the beetroot in a pan of boiling water and simmer for 40 minutes until tender. Peel and slice. Cook the beans in a large pan of boiling salted water for 4 minutes until tender. Refresh under cold water and drain thoroughly. Meanwhile, using a teaspoon, deseed the cucumber, then cut into slices about 2mm thick. Sprinkle with 2 pinches of sea salt and set aside for 30 minutes. Wash and drain. Mix the cucumber with 2 tbsp dressing and the crème fraîche. 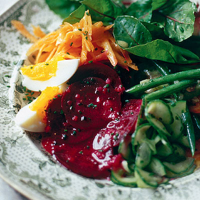 Mix the beetroot slices with 4 tbsp dressing and half the chopped shallots. Mix the beans with 2 tbsp dressing and the remaining shallots. Mix the grated carrot with all but 1 tbsp of the remaining dressing. Season each dish well and set aside. Arrange each of the vegetable salads, the salad leaves and hard-boiled eggs on a serving plate. Add the tomato slices and spoon the remaining dressing over them. Sprinkle the whole dish with the chopped chives.